Portable Trade Show Displays and Exhibit Booths. Easy On-line Ordering. Free Ground Shipping. Eclipse pop-up trade show displays with custom-printed graphic panels. 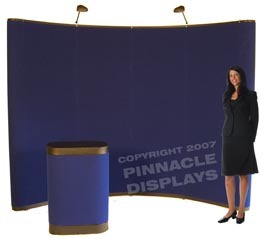 Eclipse pop-up trade show display with Velcro-receptive fabric panels. Three seconds... that's about how long you have to get the attention of a potential customer walking by your trade show convention booth. Having the right trade show display is critical to your trade show exhibiting success. Your trade show exhibit booth needs to stand out from all the other exhibit booths and get your company noticed. It has to grab qualified prospects and draw them into your trade show booth. It has to get the job done. The Eclipse pop-up trade show display is available with either Velcro-receptive fabric panels or with custom-printed graphic panels produced from your print-ready design. The Eclipse display with Velcro-receptive fabric panels is for our customers who want to produce their own graphics (posters, signs, banners, etc) locally and then attach them to the Eclipse display with Velcro, and is available in your choice of black, blue, or gray colored Velcro-receptive fabric. Eclipse portable pop up trade show booth displays come in multiple sizes, including a 6ft table-top display model, an 8ft table-top display model, an 8ft floor display model, a 10ft floor display model, a 20ft floor display model, and the new 10ft premium wave floor display model. The Eclipse booth display utilizes the traditional "pop up" display frame design. 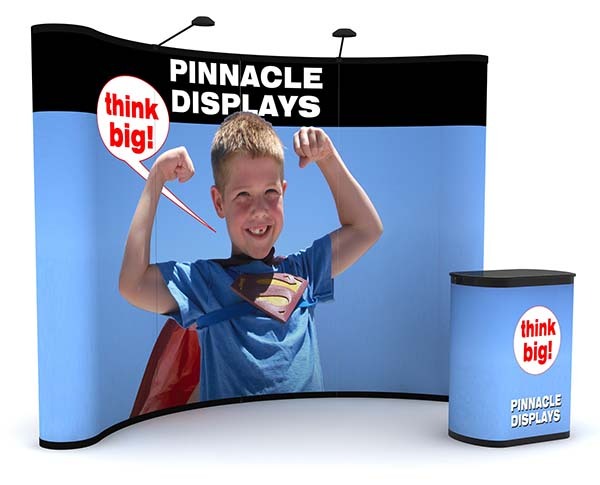 When you buy your trade show display from Pinnacle Displays, you receive more than just a superior high-quality durable portable display... you also receive true customer service and support. Please take the time to browse through our customer testimonials and reviews and decide for yourself. In addition to providing excellent customer service and expertise, we strive to make your trade show exhibit display buying experience as easy as possible. We offer simple, secure on-line ordering for all of our trade show displays, and we offer free ground shipping for all display orders and portable exhibit booth orders shipping within the lower 48 United States. We are a California based American manufacturer, vendor, and supplier of portable tradeshow displays, convention booths, and marketing displays. Eclipse® trade show displays are proudly made in the USA. copyright © 1997-2018 Pinnacle Displays, Inc.